Which Countries Are the East’s Most Promising for Research and Development? 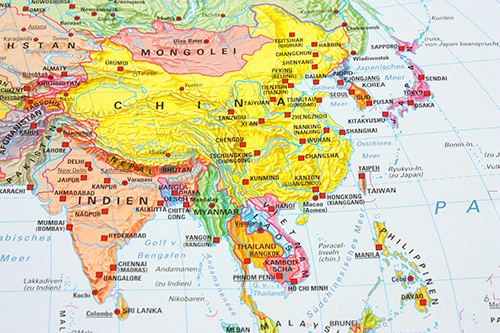 Two sets of numbers shows how far biopharma activity has progressed in Asia recently. The value of biotech venture capital funding during the first quarter zoomed to $174 million in the first quarter from $150 million in Q4 2015 and a mere $9.4 million in Q1 2015, according to Tech In Asia. But as the news outlet acknowledges, biotech accounts for a small fraction of total VC funding. The best guess of how small comes from KPMG and CB Insights, whose most recent quarterly Venture Pulse report included biotech within a “healthcare” sector that accounted for 5% of Q1 2016 deals, unchanged from the previous quarter and the year-ago quarter. Another set of illustrative numbers for biotech in Asia is tucked within the latest edition of Thomson Reuters’ annual “State of Innovation” report. Of the top 10 global generators of patents for biotechnology inventions in 2015—what the report calls “global biotechnology innovators”—four come from Asia. Three of the four Asian patent generators on the top 10 are Chinese institutions, with the University of Jiangnan placing second with 287 inventions, second only to DuPont and its 407 inventions. Asia’s other top innovators include the University of Zhejiang (fifth with 200 inventions), South Korea’s Rural Development Administration (sixth with 191), and China’s Lanzhou Veterinary Research Institute, part of the Chinese Academy of Agricultural Sciences (ninth with 165). Following is GEN’s 2016 edition of its annual Asian cluster ranking. As with U.S. regions and European nations spotlighted recently, Asian countries benefited from increases in venture capital and public research funding, as well as in initial public offerings (IPOs), at least until financial markets began to cool down late last year. Year-to-year trends in jobs and companies are made difficult to discern as many of those figures come from nations that update their figures less than annually. Malaysia has set its biotech sights high since 2005, when then-Prime Minister Abdullah Badawi launched the country’s first national biotech program with a goal of generating 5% of GDP by 2020. Progress has been steady, if slow. Malaysia ranks seventh in jobs (25,397 as of April), toward its equally ambitious goal of growing its biotech workforce to 170,000 jobs by 2020. One further step in that direction occurred in April, when 20 biotech companies in Johor joined 17 others in a program that trains college students for careers in the industry; last year 1,831 students completed the Johor Bio Talent Programme, of which 71% found jobs before finishing, The Star reported. However, the country places lower in R&D ($7.351 billion in 2012, according to UNESCO) and patents (eighth with 321 listing at least one Malaysian inventor, according to WIPO). As for IPOs, Malaysia has seen a single biotech IPO since 2015: Bioalpha Holdings, which raised $5 million last year. What Singapore’s bioindustry may lack in numbers, it more than makes up in activity: The city-state has a well-known and enviable concentration of more than 30 corporate giants that have developed R&D sites and/or Asian regional headquarters. In April, Nestlé said it would expand its activity in the country by establishing a Nestlé Research Centre Asia at Biopolis, Singapore’s biomedical research hub, focused on healthy aging. Another, less obvious strength, is the growth of domestic biotechs: Within the past month, Mundipharma announced plans for a 7,300-square-meter (78,577-square-foot) R&D, manufacturing and distribution center in Tuas, while Hummingbird Bioscience (co-based in Singapore and Shanghai) inked a collaboration to develop therapeutic antibodies to treat cancer. Singapore ranked sixth in IPOs with $126 million raised by three companies, though much of that ($102 million) was generated by Wave Life Sciences, which is dually based in Singapore and Cambridge, MA. Singapore also ranks sixth in patents (sixth with 1,677 listing at least one Singaporean inventor, according to WIPO); as well as seventh in R&D ($8.686 billion in 2013, according to OECD), and eighth in companies (95 in 2012). Australia’s biotech industry group AusBiotech was among those cheering Prime Minister Malcolm Turnbull’s government in December after it announced a National Innovation and Sciences Agenda (NISA) designed to position Down Under as a leader in biotech and other technologies. NISA’s provisions included a A$250 million ($181 million) Biomedical Translation Fund designed to stimulate more commercialization of new technologies, and increased tax incentives to stoke more startup investment. But as NISA’s website notes, Australia’s government is in caretaker mode pending the outcome of the July 2 federal election, in which a Liberal/National coalition led by Turnbull faces the Labor party led by Bill Shorten. The industry had been hoping that NISA can help lift the country above the middle of the Asian pack in biotech: Australia is fourth in jobs (more than 45,000 as of March 2016 according to AusBiotech) fifth in patents (5,930 list at least one Australian inventor, according to WIPO), and sixth in both companies (more than 400) and R&D (about $23.084 billion in 2013, according to OECD). The land once called “the Lucky Country” could use some more of that luck in IPOs, where it ranks lowest at seventh ($88 million by five companies since 2015). Taiwan’s new president Tsai Ing-wen has identified biotechnology among five sectors she is committed to expanding through government and private activity. Tsai is better versed in the industry than most national leaders, having previously been chair of home-grown TaiMed Biologics. Among her challenges as president will be further building Taiwan’s biopharma industry. The country this year will launch its BioEconomy Plan, aimed at growing the bioindustry to NT$3 trillion (US$92.1 billion) by 2020. The Plan will supplant the National Research Program for Biopharmaceuticals, created “to develop new therapeutics for disease prevention, diagnosis, and treatment” through increased commercialization and a network of incubators. That emphasis on commercialization helps explain why Taiwan ranks highest in companies (third) with 850, of which 500 are biotechs and the rest, pharmas as of 2014. Taiwan is also third in IPOs since 2015 thanks to the $316 million raised by a single company, API/ injection drug manufacturer Pharmally International Holding. Competition from larger neighbors—especially China, which still seeks unification—holds Taiwan to lower ranks on other measures. The country is fifth in R&D ($32.430 billion in 2014, according to OECD), as well as fifth in jobs (37,340 in 2014, consisting of 18,340 biotech and 19,000 pharmaceutical jobs). Taiwan is seventh in patents (637 listing at least one Taiwanese inventor, according to WIPO). South Korea has pledged in recent years to build up its biopharma industry. And in April, President Park Geun-hye received some recommendations for fulfilling that promise from the Presidential Advisory Council on Science & Technology. Among its suggestions was government support for more than 100 biotech startups, a move it said would help boost the nation’s share of the global biotech market from the 1.2% recorded in 2025 to 5% by 2025. The panel also urged that President Park’s government create an R&D center tailored to early-stage companies, financial incentives, and programs to help them expand overseas. The business focus is understandable since South Korea’s lower rankings are in number of companies (fourth with approximately 600 in 2014), IPOs (fifth with $201.88 million raised by 12 companies), and jobs (sixth with 35,596 in 2014). The IPO picture was clouded by Samsung’s delay of its initial offering of biosimilar developer Samsung Bioepis stock due to market conditions. Samsung instead plans to take public its biopharmaceutical contract manufacturing affiliate Samsung Biologics, a potential blockbuster IPO that could raise KRW 2 trillion to 3 trillion ($1.68 billion to $2.52 billion). Korea fares better in R&D (third with $72.267 billion in 2014, according to OECD) and especially patents (7,531 listing at least one South Korean inventor, according to WIPO). India rang out 2015 by unveiling a five-year National Biotechnology Development Strategy, which the government of Prime Minister Narendra Modi hopes will deliver on the long-stated goal of catapulting the sector into a $100 billion industry by 2025. The strategy will focus on healthcare, food/nutrition, clean energy, and education, and will create a Technology Development and Translation network to include 5 new clusters, 40 incubators, 150 tech transfer offices, and 20 “bio-connect” centers to promote academia-industry partnerships. India is also looking to nurture new businesses through the “Startup India” program launched in January. As The Hindu reported back then, officials aim to shrink the 65% of Indian startups that now move out of India, usually to Singapore, due to red tape—and the 90% of funding for Indian startups that now comes from outside the country. India is second in IPOs ($451 million raised by six companies), with a possible seventh IPO emerging this month when news outlets reported the Hyderabad-based API manufacturer Laurus Labs was planning to raise between $148 million and $177.5 million, depending how shares are priced. India is also second in companies (3,000 pharma companies, according to the Pharmaceutical Export Promotion Council and India Brand Equity Foundation, which also lists 800 biotechs); third in patents (7,475 listing at least one Japanese inventor, according to WIPO); and fourth in R&D ($48,063 billion in 2011, according to UNESCO). For years, biopharma activity in Japan was dominated by heritage pharmaceutical giants led by Takeda and Astellas, as well as academic and other research institutions. But in recent years, the country’s biotechs have established a presence of their own. Japan’s biotechs raised the third highest amount of capital through IPOs since last year ($263.2 million by five companies). Not that the pharmas aren’t busy: 91-year-old Chugai Pharmaceutical on May 20 agreed to pay Osaka University 10 billion ($91.5 million) over 10 years in return for access to information on results relating to independent basic research projects at the University’s Immunology Frontier Research Center (IFReC) and the right of first refusal for joint research. Japan continues to be Asia’s number-one country in biotech and pharma patents (18,752 listing at least one Japanese inventor, according to WIPO), as well as a solid second in R&D ($166.861 billion in 2014, according to OECD). However, the “Land of the Rising Sun” ranks lower in companies (third with 1,100+ in 2011, including 538 biotechs), and second to China in jobs (figures in recent years have varied wildly from 210,000, to about 878,000). Asia’s biotech leader is, not surprisingly, number-one in four of the five measures used in ranking this List, starting with R&D ($368.732 billion in 2013, according to OECD). Keeping China on top in R&D is among priorities of the new 13th Five-Year Plan that took effect this year: It encourages biopharma to expand development programs in order “to strengthen the prevention and cure of infectious, chronic, and endemic diseases,” and sets the stage for a new competitive grant program to fund stem cell and translational research. The world’s most populous nation is also the leader in IPOs ($1.936 billion raised by 14 companies), as well in number of companies (7,500, of which at least 5,000 are pharmaceuticals), and jobs. The IPO surge occurred despite a suspension of activity from July-November 2015 in response to underperforming financial markets. As for employment, consensus numbers are hard to come by; they have been pegged as low as 250,000+ in 2013 (Kelly Services) and as high as 2,882,903 in full-time R&D positions in 2014 (JLL). On its only lagging measure of patents, China is rapidly climbing to the top, though for now it is fourth (7,200 listing at least one Chinese inventor, according to WIPO). In addition to the new Five-Year Plan, China aims to grow in biopharma through new brain and precision medicine initiatives in the works; some reports have pegged the precision-medicine program at $9 billion over 15 years, but an official told Nature earlier this year that details have yet to be decided. To view last year's Top 8 Asian Biopharma Clusters 2015 click here. • Public R&D spending—Figures for most nations appear in the Organization for Economic Co-operation and Development (OECD)’s most recent edition of its twice-annual Main Science and Technology Indicators, published in February 2016. For nations not included in OECD data, GEN cited figures published by UNESCO Institute for Statistics on its website. • Patents—Based on the number of “biotechnology” and “pharmaceutical” patents as of May 19 that listed at least one inventor from that nation in the World Intellectual Property Organization’s PATENTSCOPE database, consisting of some 56 million patent documents, including 2.9 million international patent applications published through the Patent Cooperation Treaty (PCT) of 1970, under which applicants can simultaneously seek protection for their inventions in 148 countries. • Initial public offerings—Figures taken from a combination of publicly available data sources and company announcements dating back to 2015, to ensure a minimum number of Asian nations that could be ranked. • Number of companies—Combines figures furnished by the countries themselves on their own websites, in publicly available reports or public announcements, or in press articles when written by or directly attributed to an industry source. • Jobs—Based on various sources, from industry groups, regional life sciences campuses, public and/or private economic development groups, and press articles when written by or directly attributed to an industry source. Because of differences in criteria such as inclusion of medical device or hospital patient-care positions, GEN found widespread discrepancies in job figures, including among several of the top-ranked regions. Two countries included in some Asian cluster listings, Israel and Turkey, do not appear on this list since their locations within the Middle East also place them on cluster listings for that region.